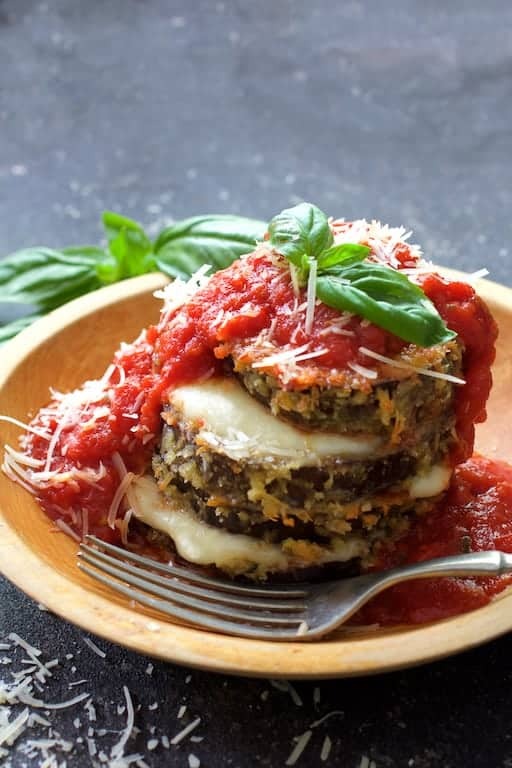 Eggplant Parmesan Stacks are a fresher and lighter way to enjoy an Italian classic! 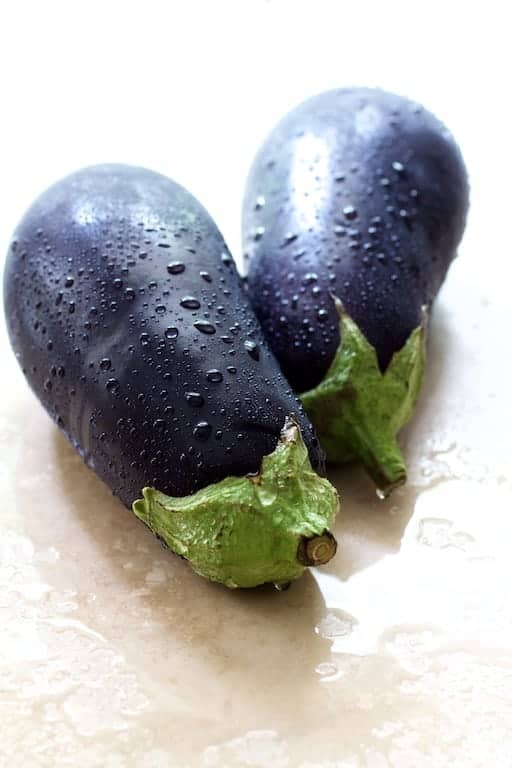 As the first eggplant is ripening in our garden, I’m already anticipating one of my favorite dishes: Eggplant Parmesan! Eggplant Parmesan is a classic Italian-style dish. 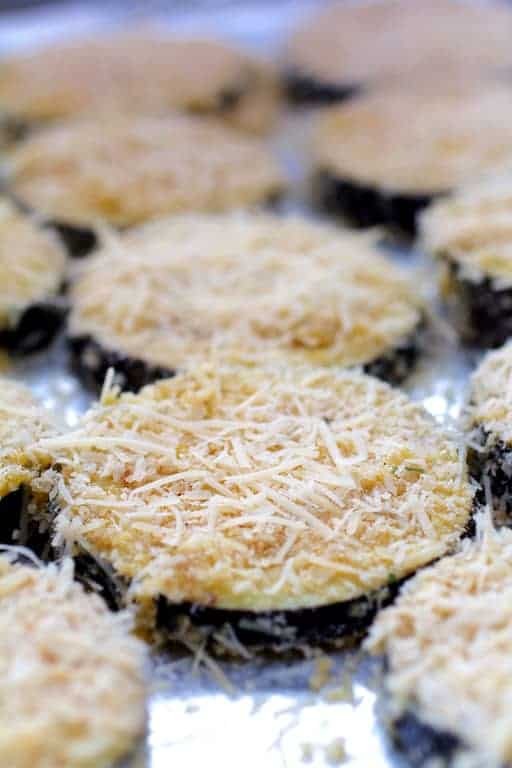 The usual way to prepare it is to salt the eggplant first and let it drain in a colander, pat dry, then coat with a breadcrumb and cheese mixture and fry it. Layered with tons of cheese and sauced can make for a very heavy dish. Here’s a lighter and fresher way to enjoy classic Eggplant Parmesan! Eggplant has a pleasantly bitter flavor. Salting the eggplant is meant to draw out that “bitterness” that some people find objectionable. I actually like that flavor so I don’t salt and drain eggplant for this dish. Salt it and drain it if you like. However, not heavily salting eggplant makes it immediately more healthful. And don’t peel the eggplant! That gorgeous purple skin contains important antioxidants. The texture of eggplant is sponge-like so it soaks up a ton of oil when fried. Baking the eggplant for Eggplant Parmesan will help reduce the fat significantly. I spray a non-stick baking sheet with cooking spray, set the breaded eggplant on the baking sheet, then give each slice a shot of cooking spray. You can also line a baking sheet with non-stick aluminum foil. I like my eggplant slices to be approximately 1/2-inch thick and got 14 slices from a medium eggplant. If that’s the case, simply make two of the eggplant towers four layers high which will make heartier appetites happy! 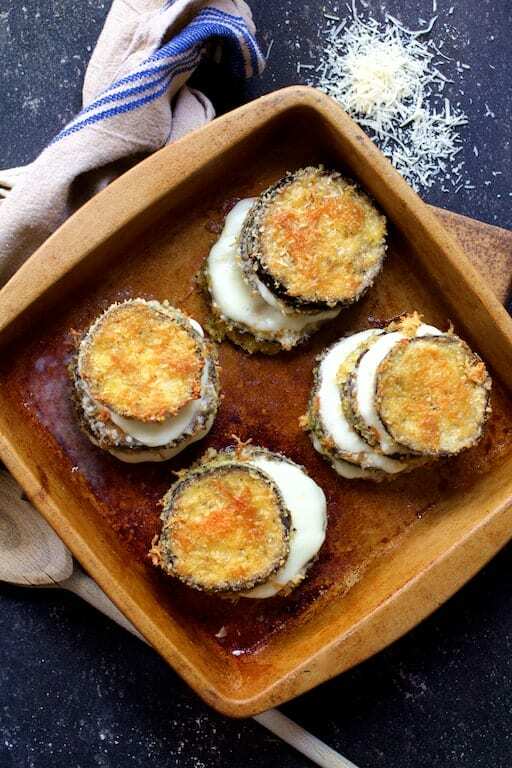 While the eggplant slices are still warm from the oven, stack it and layer with fresh mozzarella then return to the oven for the cheese to melt. Cover loosely so the eggplant slices don’t brown more. 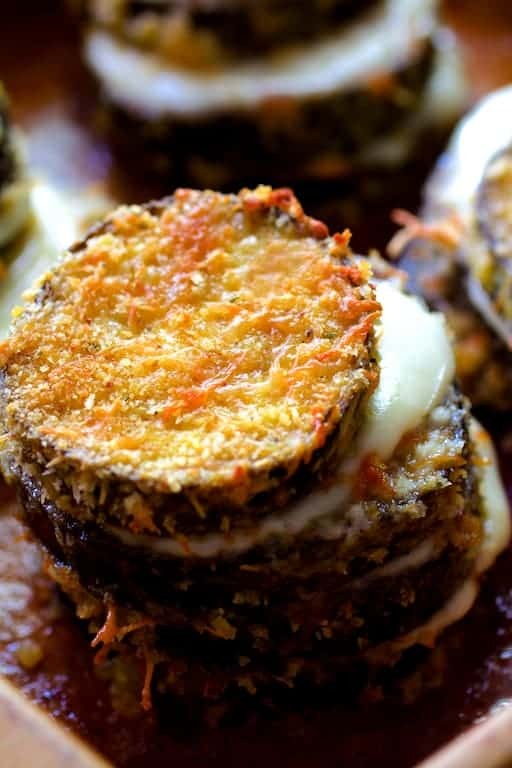 And yes, with that ooey-gooey cheese, the Eggplant Parmesan stacks may slide around a bit. Mwwwahhhh! Different brands of crushed tomatoes vary in thickness. Some can be quite thick and almost paste-like. I used Cento which is fairly thick so just rinsed out the can with a little water and added it to the pan. 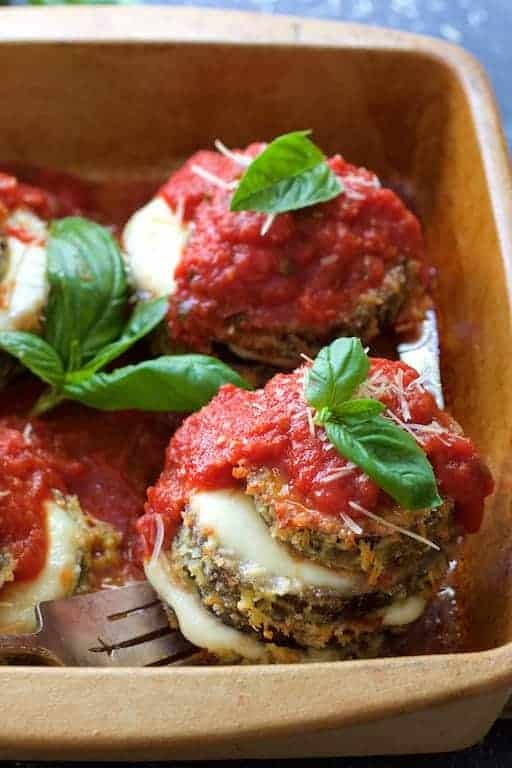 Spoon the tasty tomato sauce over the top and serve over the stacks for a fresher, lighter spin on classic Eggplant Parmesan! Love eggplant? Here are more delicious recipes! 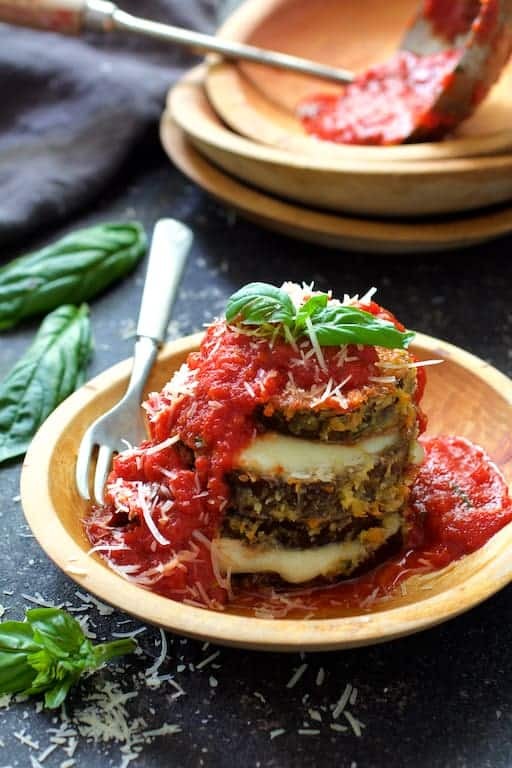 Eggplant Parmesan Stacks are a fresher and lighter way to enjoy this Italian classic! EGGPLANT: Preheat oven to 375 degrees. Prepare a non-stick baking sheet by spraying it with cooking spray. Alternately, line a baking sheet with non-stick aluminum foil and spray with cooking spray. Set aside. Place all-purpose flour on a plate and season with salt and black pepper. Place eggs in a small bowl and season with salt and pepper. Combine Parmesan cheese, breadcrumbs and panko in another bowl. Dredge eggplant slices in flour. Dip in beaten egg then coat with breadcrumb mixture. Place on prepared baking sheet. Bake for 12-15 minutes. 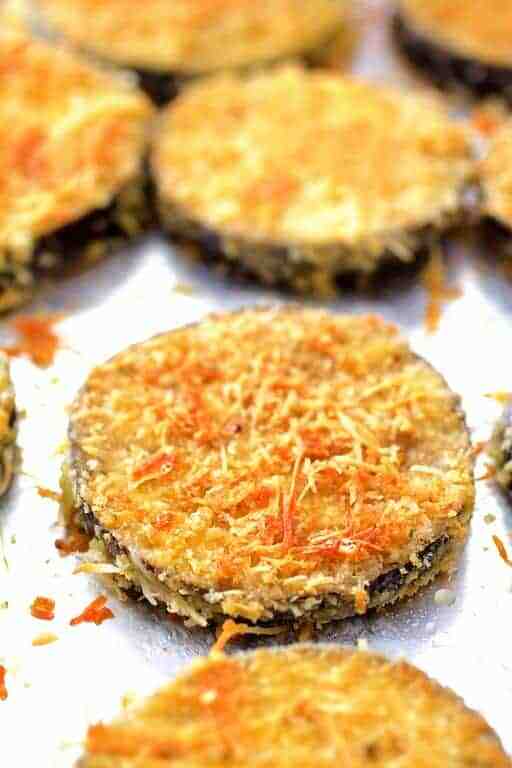 Flip eggplant slices and bake an additional 10-12 minutes or until both sides are golden and eggplant is tender. SAUCE: While eggplant is baking, prepare sauce. Heat olive oil over medium-high heat. Add the tomato, reduce heat to medium-low and cook 5-7 minutes or until tomato is soft. Add garlic and cook 1 minute. Add crushed tomatoes and crushed red pepper flakes. Simmer 10 minutes. Stir in fresh basil and keep warm. TO FINISH: Prepare a baking dish with oil or cooking spray. Cover loosely with aluminum foil and bake 10-15 minutes or until cheese has melted. Top with tomato sauce. Sprinkle with additional parmesan cheese and garnish with fresh basil sprigs and serve. The stacking really ups the elegance factor here. These are absolutely gorgeous, Carol! This looks like such an elegant meal that would be easy enough to pull off on a weeknight. Can’t wait to try this out! These look delicious! Perfect for a light dinner during the week. Pinned to my must make list!! This is a definite must make!! We love eggplant and it does have a tendency to absorb the olive oil I baste it with. I’ve already got eggplant on my grocery list. I am definitely trying this! 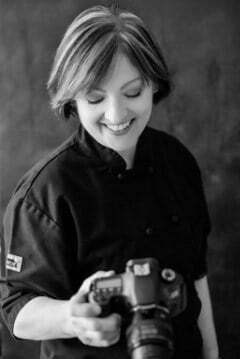 My husband and I love eggplant but I hardly ever make it because the kids don’t (hoping they will eventually! I sneak it in sometimes.) This looks delicious! Hi, Michelle! I gave this recipe to a friend a while back and she makes it for her family all the time. Her husband didn’t like eggplant, but he enjoys it this way. The kids may go for it; the eggplant is tender inside but the coating is nice and crunchy which kids love!